Whether you're looking to purchase some flowers to add a bit of color to your home or you need to decorate for a bridal shower or wedding, consider saving yourself some money by buying discounted or wholesale cut flowers. There are places where you can find inexpensive--and yet beautiful and fresh--flowers. There are ways to ensure the discounted flowers are still healthy and appropriate to use for your home or elaborate events. Visit a flower market or farmers' market to purchase discounted flowers. At a flower market, you can often negotiate a price with the flower vendor. Check your local newspaper about when and where upcoming markets are held. Look up "wholesale flowers" in the Yellow Pages, Yellow Book or even online. You will be able to find flower shops that offer wholesale flowers. You can also call local flower shops and ask about any special promotions or sales on the flowers for that day. Shop online. 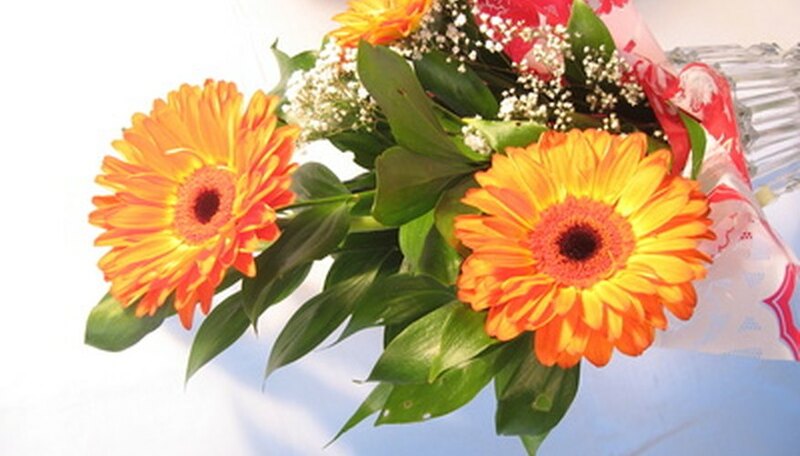 There are dozens of different florist websites that offer delivered flowers at discounted prices. Purchase your flowers for large "economy" stores, such as Sam's Club or Costco. These stores tend to sell beautiful flowers and bouquets at great prices. Call the stores for information on flower sales and order the flowers ahead of time. Purchase flowers at a florist's shop the day after big holidays, for example, Christmas, Valentine's Day, Mother's Day and Sweetest Day. "Specialty" flowers and bouquets will be discounted greatly, and arrangements should be only one or two days old. Look at the stems of the flowers. Healthy flowers have bright green, strong stems. When you bend the bottom of the stem, it should simply snap off. Some flowers may be discounted if they are getting too old or dying. These flowers' stems will be brown, soggy and will not snap off when bent. They will also have a putrid smell. Touch the leaves of the flowers you'd like to purchase. Healthy flowers will have leaves that are firm to the touch, pointing upward. Old, dying flowers will have leaves that are wilting and are soft to the touch. Similar to the stems, fresh leaves will snap off, whereas dying leaves will not. Observe the buds and petals of the discounted flowers. Buds should be firm to the touch, and the petals of opened flowers should not be brown or withered. Purchase hardy flowers. According to the Association of Specialty Cut Flower Growers (ASCFG), choose a beautiful flower like the lisianthus (eustoma) "Vulcan Purple Picotee" II. The ASCFG states that hardy flowers with strong stems and thick petals are "more durable in shipping and give a long vase life."